My daughter had a sesame challenge on May 11th and she passed! I posted about it on a Facebook group, but just realized that I did not blog about it, here. :O It also felt surreal for her to pass the challenge, so I kept waiting to make sure it was "real" and so far, so good! 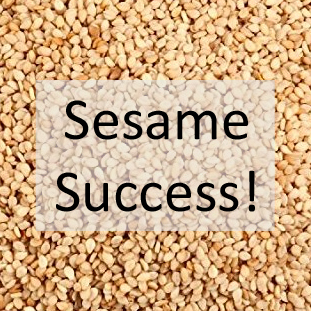 Sesame has been on my list to challenge, for quite a while, and we finally got around to it. It can be so hard to find a time to plan one when you don't have other things going on, but I realized that I really need to get going on these, or it will take forever to get through them all. 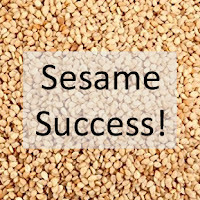 Sesame fell into the category of "high IgE but no reaction history". Her IgE to sesame had been as high as 15, then was almost 3 before treatment and then dropped down and hovered in the high 1s, low 2s. Back in 2015, we did skin prick tests (SPTs) for a few foods, including sesame and flax, and they came out positive, so we were told it wasn't time for a challenge, yet. As time passed, I felt that the SPTs were lagging indicators and I also felt that the IgE levels just weren't going to get to be negative. Treatment with Dr. Li's protocol seeks to regulate the immune system and after a while under treatment, standard IgE testing becomes less and less easy to read as an "up bad/down good" indicator. Though there is an expectation that IgE will fall over time, it may never get back to a pre-allergic level. There's a long story there, but for now, let's focus on the sesame challenge. For the challenge, I made "tahini cookies" which are pretty much peanut butter cookies using the tahini (ground sesame seeds) in the place of peanut butter. I used the Kevala brand, as their tahini is made in a facility that only processes sesame seeds. I chose tahini, over sesame seeds, because I had read that people sometimes have delayed reactions, when the stomach breaks down the outer seed and gets to the protein. Even with as nervous a person as I can be, I wanted the highest-protein version, so I could be sure that any other forms would only be a lesser risk. Throughout the challenge, my daughter didn't really have any major issues, thankfully. She sprouted this light pink spot she gets, sometimes. I can't even call it a hive, because it's so small and not raised and it vanished before I could even load my camera option on my phone. Somewhere into the second dose, though, I did see her shrug her right shoulder toward her ear and she was headed toward her ear with her "pinky" finger. 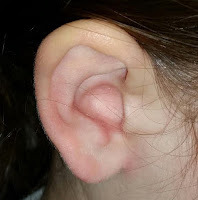 I asked her not to touch her ear, but I got the sense it was a bit itchy. 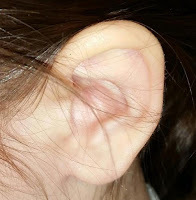 I took pictures of both ears and noticed that the right one was a bit pink (more so than really shows in the picture, but not bright red, either.) The funny thing is, when I had some of the same cookie batch the night before, I had an itchy right ear for a bit. :P Anyway, I told the doctor, and she decided to make the next "dose" a little bit smaller. The subsequent "doses" were all fine and her ear went back to normal, without intervention. They had us wait 1 hour after the last dose, but said we could go after that, since it went so well. During the 1-hour waiting period, her cheeks were a little pink, but she was lying down, so tired from having gotten up early. The pinkness didn't last and I've seen the same pinkness on many days when we haven't done anything out of the ordinary. One thing that did calm my nerves a bit, even though it's not definitive, was that she is negative to Ara h 1, which has 80% homology with Ses 1, one of the main sesame proteins. I told myself that it boded well for her challenge, but I also don't want anyone to fret if their child is Ara h 1 positive, when it comes to sesame. She eats plenty of legumes that are supposedly "botanically cross-reactive" with her other allergens, so it's all relative. for arranging a conference call with kaléo to go over details of their Auvi-Q™ AffordAbility plan. The time to submit your forms for your Auvi-Qs is NOW! As I mentioned in an update to my earlier post, forms are already being processed ahead of the 2/14 release date, so if you are interested in getting your hands on some Auvi-Q sets, follow the steps shown, below. You have the option of having it delivered to your allergist, as well, if that is more convenient, due to your schedule, or local weather patterns. You'll get "fresh" devices. Pharmacy stock can vary and we've all heard the stories of picking up EAIs with only a few months left before they expire. The devices going out on 2/14 have an expiration date of April 2018. Delivered devices are expected to have a minimum shelf-life of 12 months. 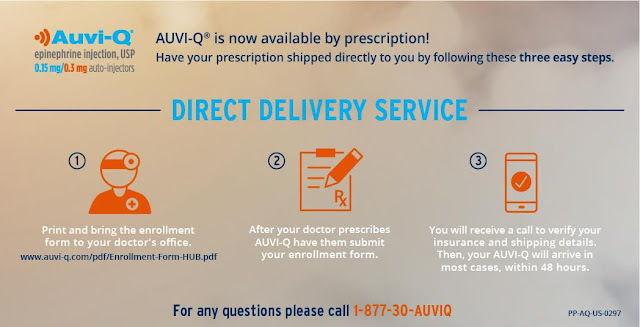 Using Direct Delivery will ensure that you get the Auvi-Q device that your healthcare provider prescribed and won't have it substituted for another device preferred by the pharmacy. After you've submitted your form for Direct Delivery, make sure to take their confirmation call! The call will come from (844) 357-3968. If you're like me and tend to ignore most "Unknown" calls, you might want to save that number to your contacts, so you'll recognize it when they call. They will confirm your coverage and your delivery address details. You'll also want to save that contact number for refill requests. If the Auvi-Q is your preferred device, submit your form ASAP! I wanted to discuss this topic as a separate post. This is written from a personal, purely speculative perspective. Some of you may have read about the new pricing plan for Auvi-Q, which includes a "list price" of $4,500. That has prompted many to wonder, "What in the world is up with the $4,500 list price?!" Yes, that sounds like a lot of money. That is a lot of money, but bear with me for a minute. I'm not surprised that many would find this list price shocking, but we need to understand how flawed the current pharmaceutical system is, at present. For those who watched the Mylan CEO senate hearings, we had a glimpse into the convoluted, opaque system. There is a complex interplay of parties like Pharmacy Benefit Managers (PBMs), insurers, pharmaceutical companies, etc. Here is a primer on the drug-pricing system, as it stands. I will admit that my eyes look upon the Auvi-Q very favorably. From the moment I saw the device, I was impressed with its size and features. I also feel favorably about Eric and Evan Edwards' direct ties to the anaphylaxis community and their personal story. They are connected and invested, both financially and emotionally. I assure you that this fondness was not paid for with the Sanofi Summit I attended years back. That summit was the seed that sprouted so many wonderful things in my life, so again, there's a fondness there, but it is not something that would prompt me to favor something I didn't believe in. So, when I say that "in my eyes," I feel like kaléo is doing their best to provide the choice and access we asked for, to the best of their ability, given the complicated environment in which they have to operate, I hope it is not dismissed as detrimentally biased. Some have expressed concern that with such a high list price, insurance companies will choose not to cover the Auvi-Q. This is not a foregone conclusion. I was previously on a medication for my rare disease that cost my insurance company over $8,000 per month, which would have been over $96,000 for the year had I continued on it. (I had to stop due to side effects.) I paid $0 out of pocket, as my $45 insurance co-pay was covered by the specialty pharmacy handling the medication. I remember being quite shocked at such a price. I remember shaking my fist at the first report we saw stating that the list price was set to be around the $100,000/year mark. I felt guilty for "costing" my insurance company so much money. However, I soon learned that my medication and its cost were not at record-setting levels. I found out that there are quite a few medications that cost even more outrageous amounts of money. 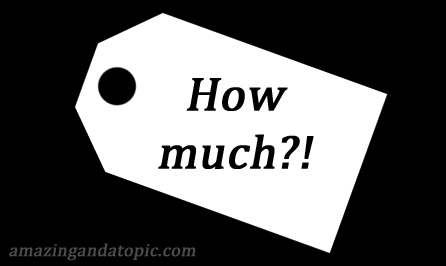 I called the specialty pharmacy and I called my insurance company to make sure that my rates were not going to go up and was assured that my rates would not change. I also considered the fact that many of the people with my rare disease either did not have insurance or had poor coverage. My insurance coverage was basically subsidizing their access to the medication. Perhaps others feel differently about such things, but I was happy with that arrangement. Anyone who needed that medication would have access. I knew the money had to come from somewhere. I did feel a little less gracious about their efforts, though, given that I knew this was an existing drug that was "re-purposed" to treat our rare disease, so I did feel a little grumpy about them making so much money off something that already existed. I was grateful, though, that the medication was being made available, because there are few alternatives for my condition. With the Auvi-Q, though, I feel things are different. This is not a 20-30 year old drug, like mine was - this is a new(ish), brand-name device. It's an innovation in its market. They haven't had decades to recover R&D costs. It's reasonable for them to expect some form of profit. Yes, it does seem startling to think that some people's insurance will fork over thousands per set, but this is the system we have and it's holding hostage the device we want. Until the system gets a complete overhaul, this is the space they're working in to provide us access. If we don't like it, we need to continue to take it up with those who can make changes. I'm pointing my dissatisfaction at the system and not at kaléo. Maybe that's because they have something I want, but as I said, this is my personal opinion. Let's say you have someone like me. I have commercial insurance. I don't know if the Auvi-Q will be covered, yet, but let's say it will be covered. My insurance company will "pay" $4,500 for a set of Auvi-Q. Let's assume there are some PBM rebates and they really "only" end up paying $3,000. Let's pick a rough number of $300 needed to cover the cost of the Auvi-Q to the manufacturer. Given these made up, rough numbers, my one prescription can cover 10 other people's prescriptions. I think we can reasonably assume that more than 1/10th of insurers will cover the Auvi-Q. I agree that the system is broken, but until the system is fixed, I believe that kaléo is doing its best to work within this flawed system to do what we asked of them - to provide epinephrine access to those who need it. The laws around medications are intricate, perplexing, and in many cases counter-intuitive. Perhaps some day the system will be fixed and this kind of pricing format will not be necessary, but until then, we need protection. We need a device that we feel comfortable with and that we believe our children will willingly carry and use if the need arises. I was discussing the list price controversy with someone and another point occurred to me. They said, "Weren't people up in arms about the EpiPen having a high list price? Isn't this even worse?" Is the list price higher? Absolutely, but I see one big difference. With the EpiPen, the list price was rising over time and an increasing number of people ended up on high-deductible plans. This resulted in the customer paying the high list price, which is when the voices of dissatisfaction rightly grew louder. Mylan didn't do anything with their rising revenue to significantly ease the burden that the patient was facing. Kaléo, on the other hand, is using the high list price to keep the cost from falling onto customers. I agree that the fact that Kaléo has to resort to such measures shows that major reform is needed. Disclaimer: This post contains information that I am providing to the best of my knowledge. Many details are currently still in flux and information may change. Ultimately, your insurer and/or kaléo will be your best source for final clarification and this information is provided as a courtesy to help navigate the often muddy waters of insurance coverage. 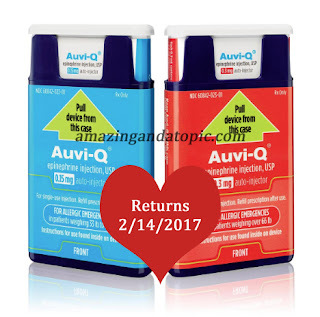 In my previous post, I provided information on Auvi-Q's upcoming re-launch. Please read that post, first, for an overview. Also please make sure to read the FAQ provided by kaléo. This post will deal with additional details and questions that have arisen. What about those on government insurance plans, such as Medicare, Medicaid, and Tricare? Those details are still being finalized. Government-sponsored plans vary widely in their coverage of prescription medications. Though not yet confirmed, co-pays for those on government-sponsored plans are expected to be $50 or less. There are several providers of government plans, each with their own coverage details. The expectation is that they will provide coverage, but the co-pay would vary based on various factors like formulary tiers, preferred status designations, etc. There is a reasonable expectation that the Auvi-Q will be covered by Tricare, but various details are still being resolved. By law, kaléo is not allowed to cover/subsidize the co-pay for patients on government insurance plans. In any event, they are working hard to ensure that everyone who wants the Auvi-Q will be able to get it as an affordable price. The Auvi-Q is an innovative, brand-name device. It's relatively new to the epinephrine auto-injector (EAI) market. It's the only talking EAI on the market. A talking EAI can be comforting and helpful for those in a high-stress situation, and/or those with no previous experience with EAIs. Its compact size makes it preferable for many teens who like to carry their devices without calling undue attention to themselves. Various insurers may see the benefits of such a device to patients and choose to provide coverage for the Auvi-Q. For those with commercial insurance, whose insurance companies do not provide Auvi-Q coverage, kaléo will absorb those costs and patients will pay $0. Those with commercial insurance are not subject to the annual household income limits. That only pertains to those without any commercial or government insurance. How can I find out of my insurance plan will cover the Auvi-Q? If you have commercial insurance, you can proceed straight to your doctor with the Direct Delivery forms, which they can submit to Kaléo. Kaléo and their partners will take care of finding out coverage details. If it's covered - you get it for $0. If it's not covered - you get it for $0. You can try to contact your provider to see if they have information, but some plans are still finalizing details. To reiterate an important point, if you have commercial insurance (as around 200 million in the U.S. do) even if your formulary does not include the Auvi-Q, it will still be $0. Is this a limited-time offer? No, this is not a coupon, or a limited-time offer. This is their pricing model for the foreseeable future and there is no set time limit. How many sets can I get? You can get up to 3 cartons per prescription, twice a year, for a total of 6 cartons per year. This applies both to sets obtained through the pharmacy and through direct purchase. Update: Due to high demand, there may currently be a limit of one set per month. Priority may also be given to those fulfilling prescriptions for the first time and newly-diagnosed. Have more questions? Please let me know! Update 2/7/2017: We had an allergist appointment on 2/4 and I submitted the form for direct delivery to our allergist. The allergist's office submitted it to see if it could be processed ahead of the 2/14 release date and it was processed, today! I just received a call and was told that my prescription was processed. Premier Specialty is the pharmacy that will be handling my prescription (I am guessing this can vary by state/plan.) They checked to see if the Auvi-Q is covered by my insurance (I have Highmark Blue Cross/Blue Shield with CVS/Caremark for prescriptions) and they said it IS covered, with a $45 co-pay. They said kaléo is covering the $45, so it will be $0 to me. It will be shipped out on 2/14 and should arrive within 48 hours. I was asked if I wanted to sign for it, but I declined. I am usually home, but don't want to miss the delivery. They also offered to let me speak with a clinician or a nurse about the medication, but I declined, as I am familiar with epinephrine and the Auvi-Q, itself. Fans of the Auvi-Q will be in for an exciting Valentine's Day treat! "After regaining the rights to AUVI-Q, kaléo conducted a thorough manufacturing assessment and invested in new technology and quality systems to ensure accurate, reliable and consistent delivery from the product. AUVI-Q is manufactured on an intelligent, high-tech, 100% automated robotic production line with more than 100 automated quality checks on each AUVI-Q, ensuring a streamlined and consistent production process." 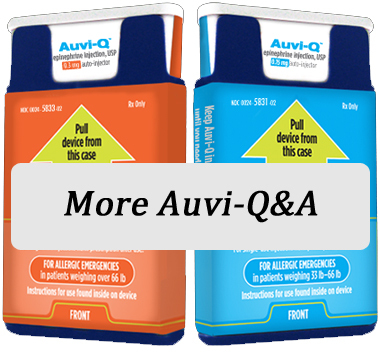 Now, let's talk about how you can get the Auvi-Q back into your anaphylaxis preparedness kit! AUVI-Q will be available free of charge to patients with a household income of less than $100,000 who do not have government or commercial insurance. The cash price for AUVI-Q is $360, and will be available to those patients without government or commercial insurance. For starters, check out their FAQ, which covers the basics of the AffordAbility™ access program. There are no coupons involved in this program (at the time of this writing) - You will obtain your prescription from your doctor and the cost to you should come up as $0. If it does not, the pharmacist can call 1-877-30-AUVI-Q (1-877-302-8847) for live assistance. On the AffordAbility™ site, look into the direct delivery option. You can have your Auvi-Q(s) mailed directly to you (or to your doctor) without going through your local pharmacy. This can help ensure that you get the best expiration dates available, and with shipment to your home, it can save an extra trip to the pharmacy. This option is available to insured and cash-paying customers. If you have insurance and your prescription benefit formulary does not provide coverage for the Auvi-Q, the cost will still be $0 to you. Here is a follow-up post with more details.